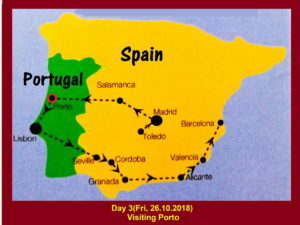 On this day, we continued our journey from Salamanca in Spain to Porto in Portugal which is 340 km west of Salamanca and the journey would take 4 hours. 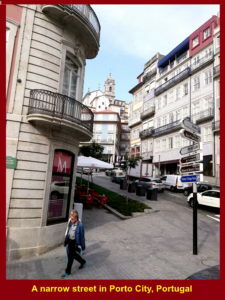 As we arrived in Porto in the evening, we stayed at a hotel, Hotel Black Tulip, for a night. On the following day, Friday, 26 October 2018, we left Hotel Black Tulip and travelled to Porto Old Town. 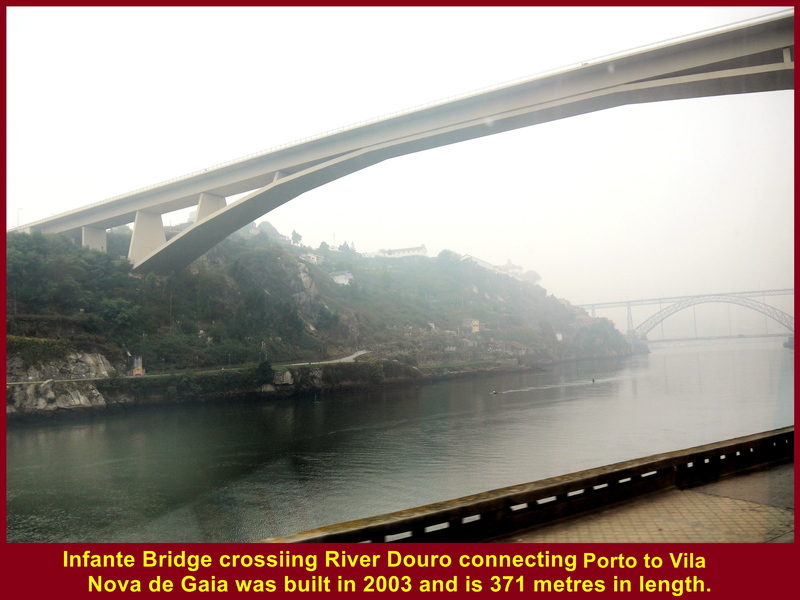 While travelling along River Douro to Porto Old Town, we saw a few bridges crossing the river, including Flexio Bridge(1995), Infante Bridge(2003) and Luis I Bridge(1886), as shown in the photos below. 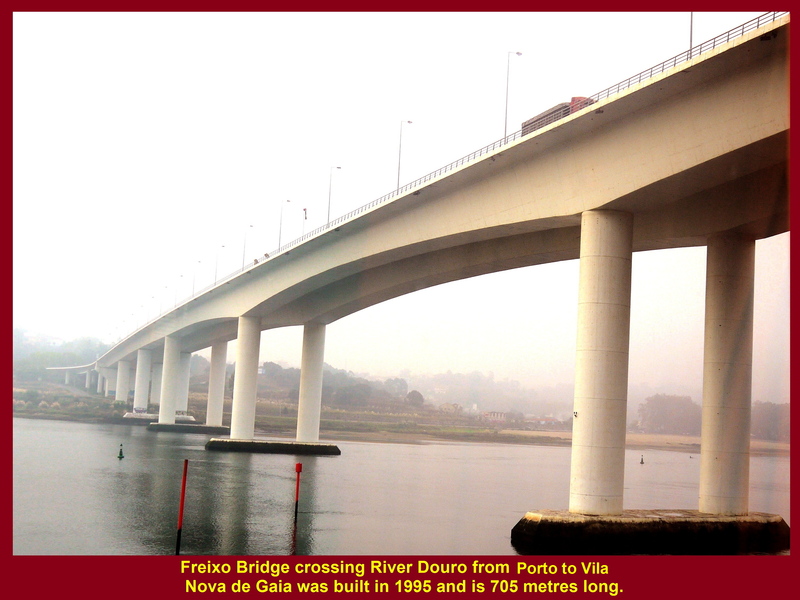 Fleixo Bridge crossing River Douro was built in 1995 and is 705 metres long. Infante Bridge crossing River Douro was built in 2003 and is 371 metres long. 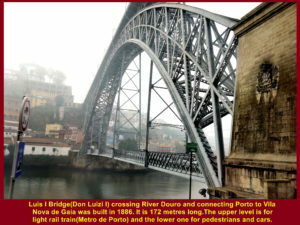 Luis I Bridge crossing River Douro was built in 1886 and 172 metres long. Luis I Bridge is a special bridge. 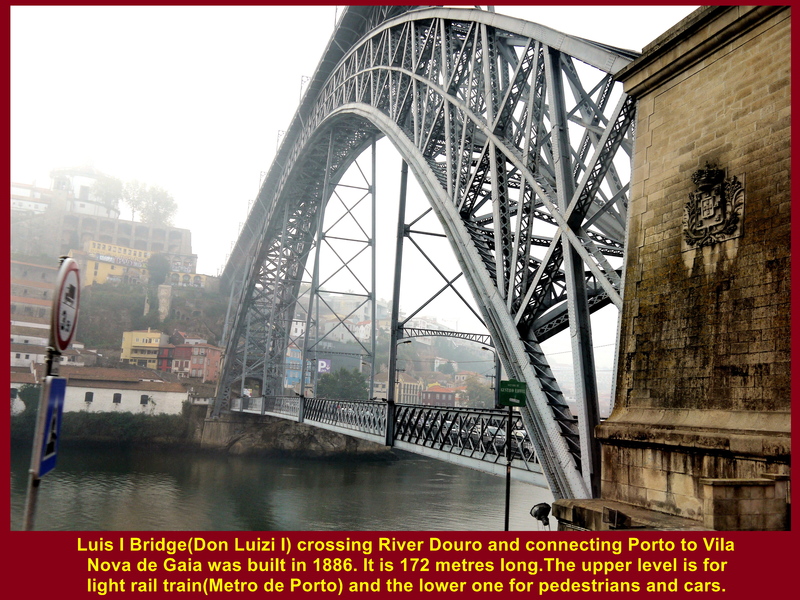 Built in 1886 over River Douro connecting Porto City to Vila Nova de Gaia, this old bridge has two levels. The upper level is for light rail train(Metro), and the lower one for pedestrians and cars. 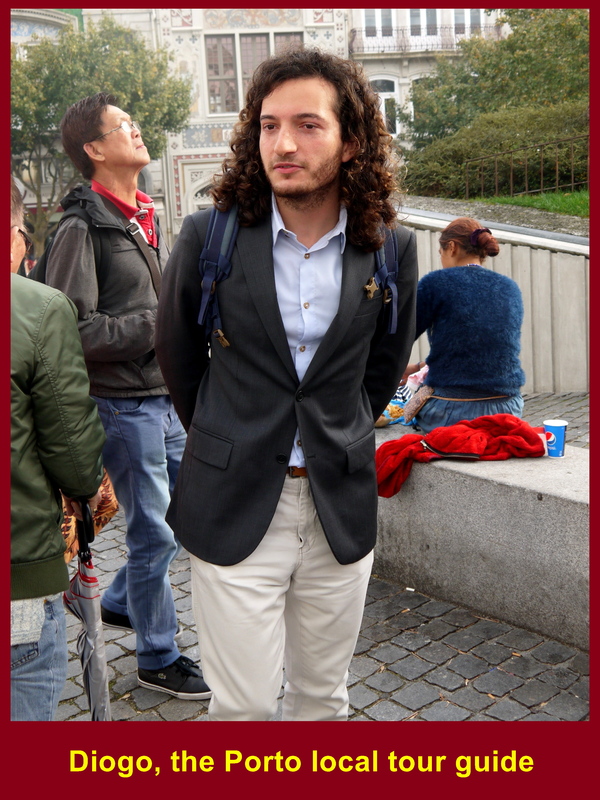 On arrival in Porto City, we were joined by a local tour guide called Diogo. He showed us around to see a few old landmarks in the old town. 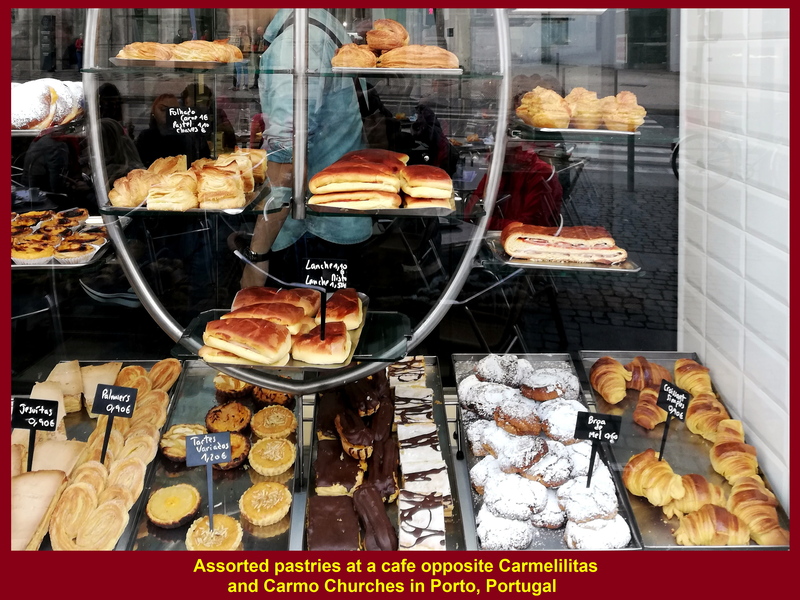 While we were on the way to two old churches in Porto Old Town, we saw a shop with a facade that was quite different from the rest in the same row. 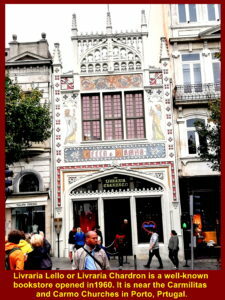 It had a white facade of an elegant architectural design with some simple paintings. It was a bookstore known as Lavraria Lello or Livraria Chadron Bookstore opened in 1960. That shop was frequented by J.K. Rowling who was teaching English in Porto from 1991 until 1993. She is a famous writer who has written Harry Potter series. 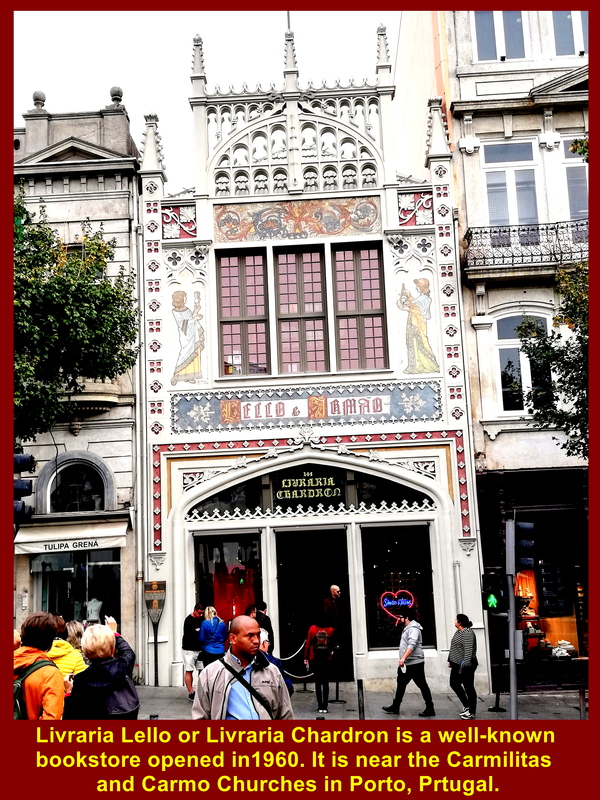 Livrari Lello or Livraria Chardron Bookstore is a well-known bookstore and opened in 1960 in Porto, Portugal. Soon we arrived at two churches which were very close to each other. 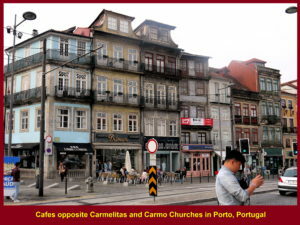 The left church is known as Carmilitas. It is a convent for nuns built in Classical style with a bell tower on the left in the 17th. Century. 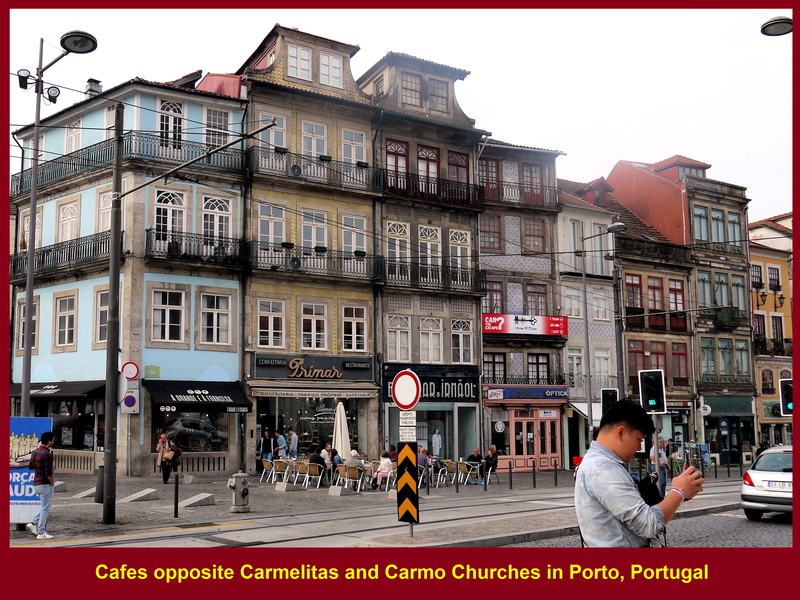 It is separated from another church, Carmo Church, for monks by a very narrow row of houses which prevents the contact between the monks and nuns. 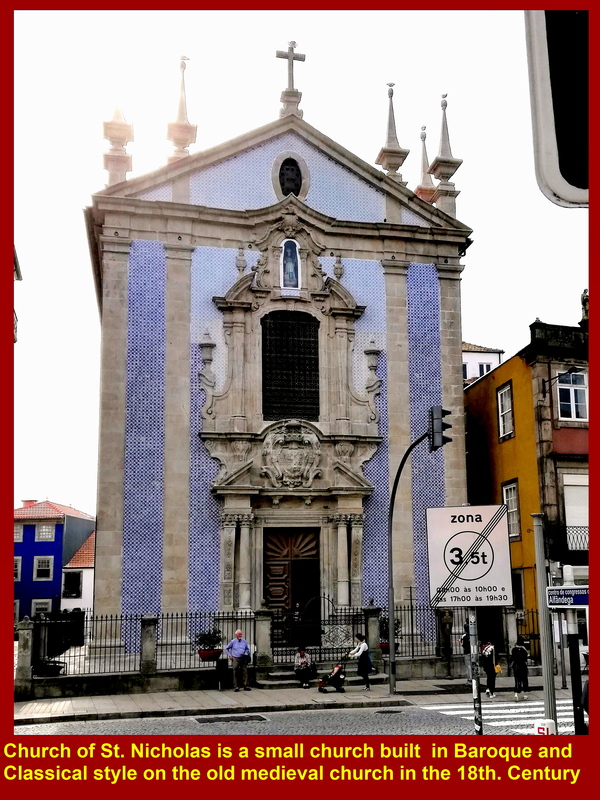 Carmo Church was built in Baroque style in the 18th. Century. 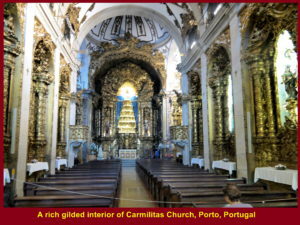 The interior of Carmilitas Church is long. 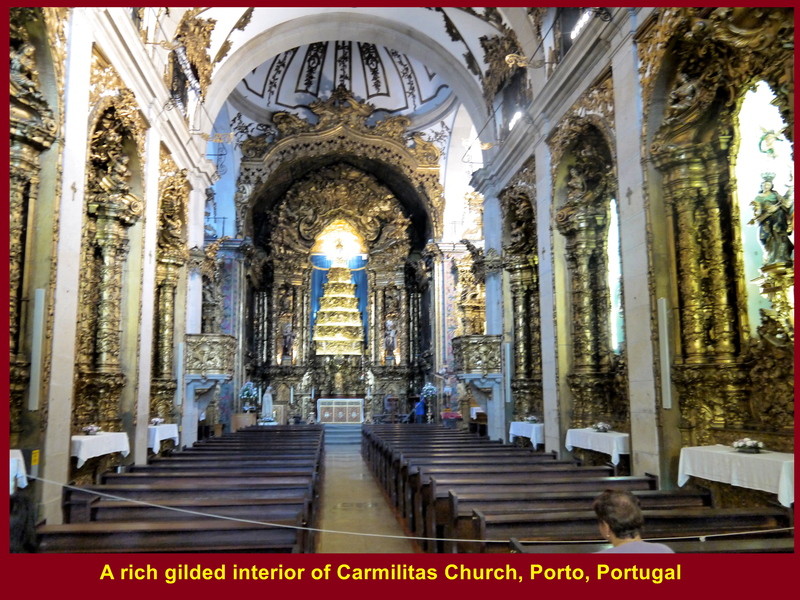 Its woodcarvings and the altar are richly gilded with gold. After visiting the two churches, we crossed the road in front of them to one of the cafes to have coffee. On the way to Freedom or Liberty Square we came across a statue in Cordoana Garden. 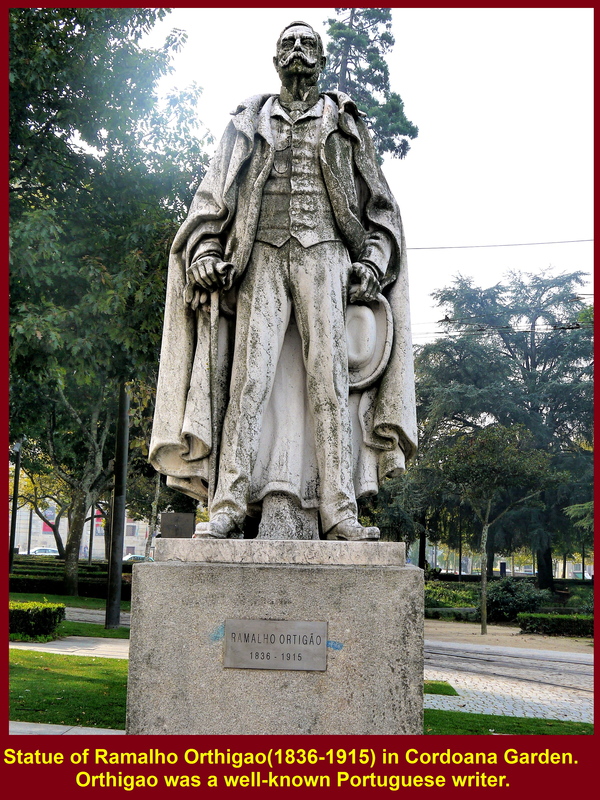 It was a statue of a famous Portuguese writer, Ramalho Orthigao(1836-1915). “The Mystery of the Sintra Road” and “As Farpas” were among his notable writings. Statue of Ramalho Orthigao(1836-1915). Orthigao was a well-known Portuguese writer. 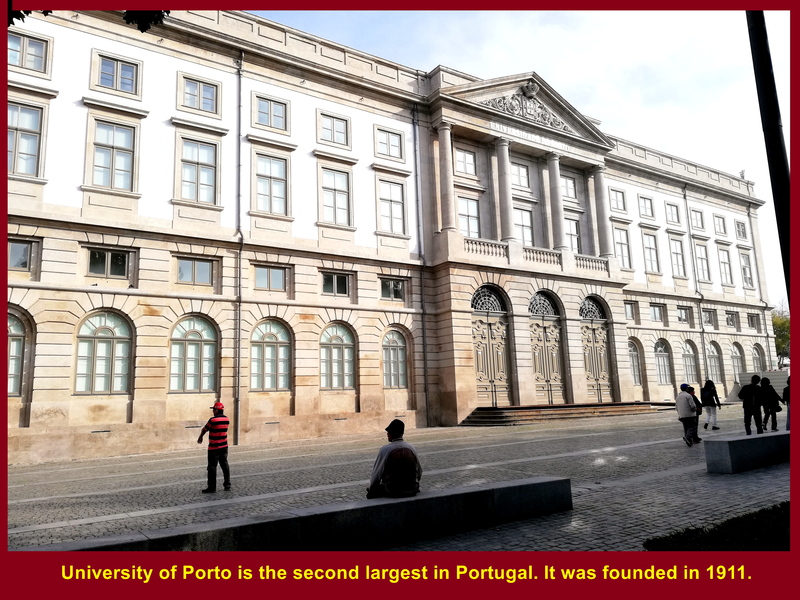 Then we passed by a large building which was University of Porto. The university was founded in 1911 and is the 2nd. largest by number of enrolled students after University of Lisbon in Portugal. 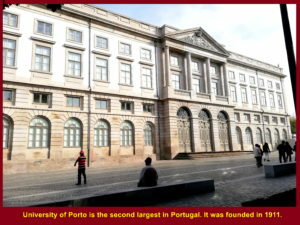 University of Porto founded in 1911 is the 2nd. largest in Portugal. 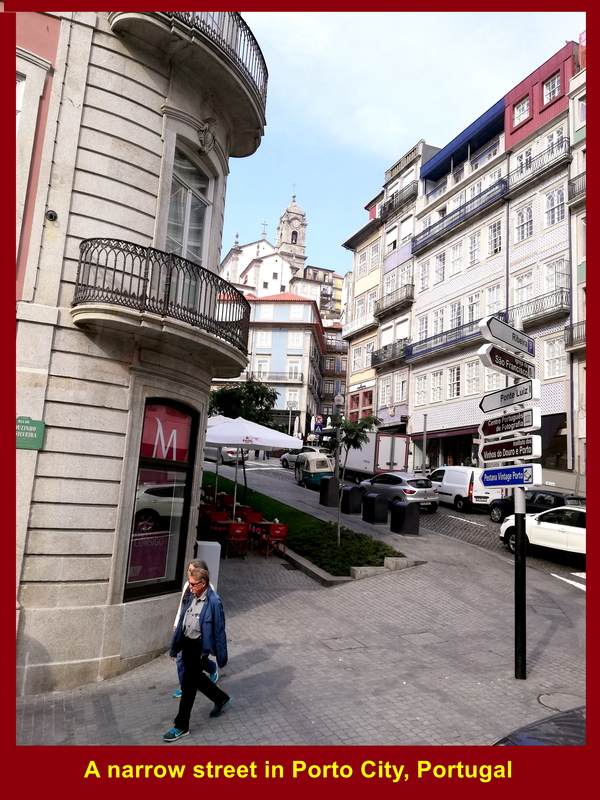 While walking away from the university, we saw a tall bell tower and a white building adjacent to it. The building is a Roman Catholic church known as Church of Clergy built in the 17th. Century for the brotherhood of clergy. 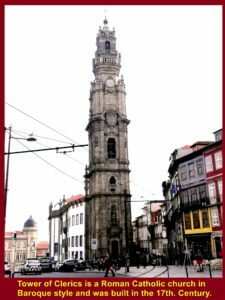 The bell tower known as Tower of Clerics was built several years later. Visitors can climb up the steep steps in the tower and have a breathtaking view of Porto City. 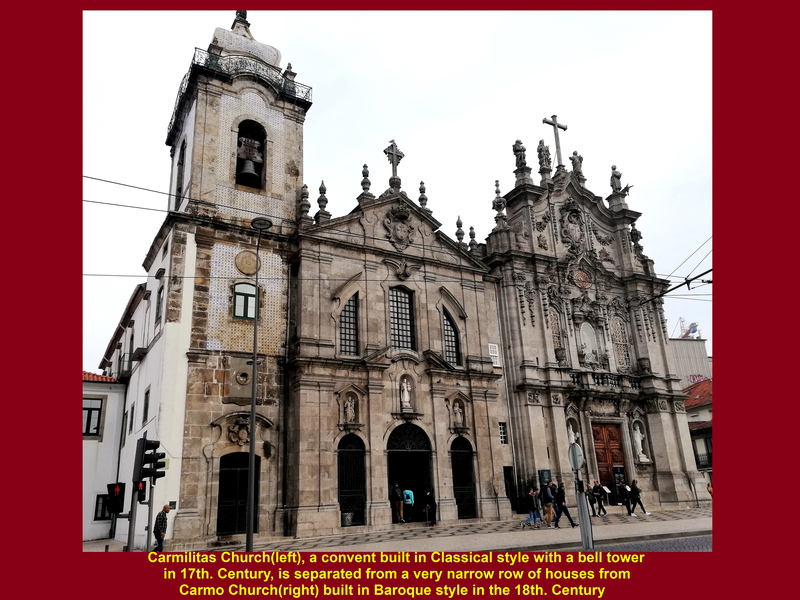 Tower of Clerics is a Roman Catholic church built in Baroque style in the 17th. Century. Soon we arrived at the Freedom or Liberty Square. 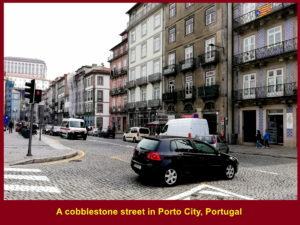 The square is in the busy business area of Porto. In the centre of the square there is a equestrian statue of King Peter IV. It is a monument in memory of King Peter IV(1798-1834). King Peter IV was the supporter of constitutional monarchy. He played a very important role in Liberal Wars(1828-1834) in which he defeated his younger brother, Miquel(1802-1866), who supported absolute monarchy. 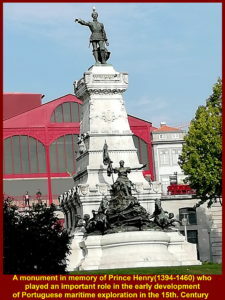 After the war in 1834, Portugal restored the constitutional monarchy. 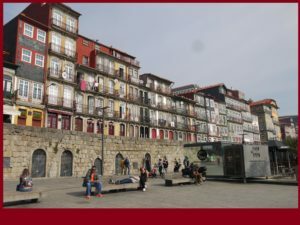 A historical building can be seen near the Liberty Square. It was built in 1767 to house the Court and Chain of Relation. 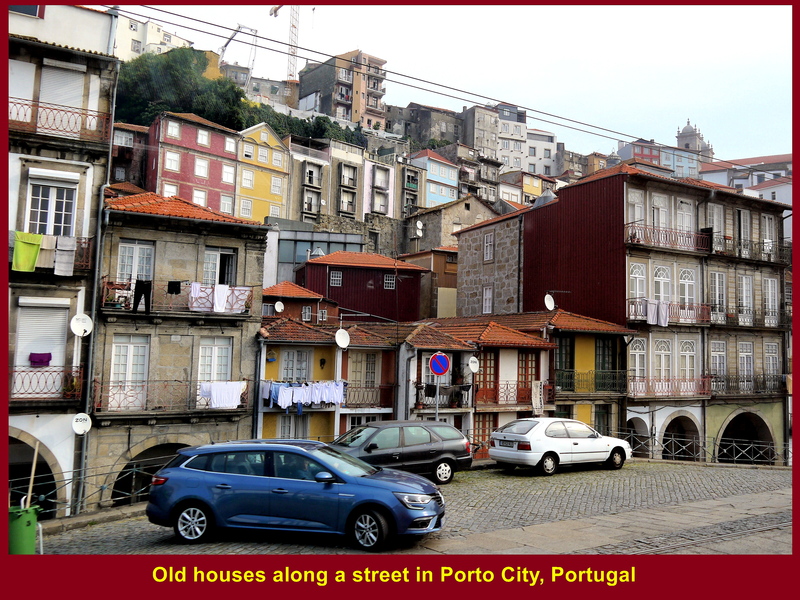 Besides, it was used as a prison until 1974 when Portugal returned to democracy. 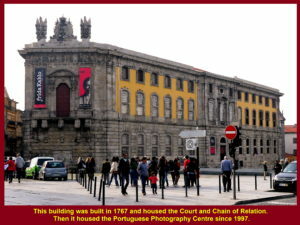 In 1997 the Portuguese Photography Centre took over the building of Court and Chain of Relation to safeguard, value and promote the photographic heritage of Portugal. This building was built in 1767 and housed the Court and Chain of Relation. Then it housed the Portuguese Photography Centre since 1997. 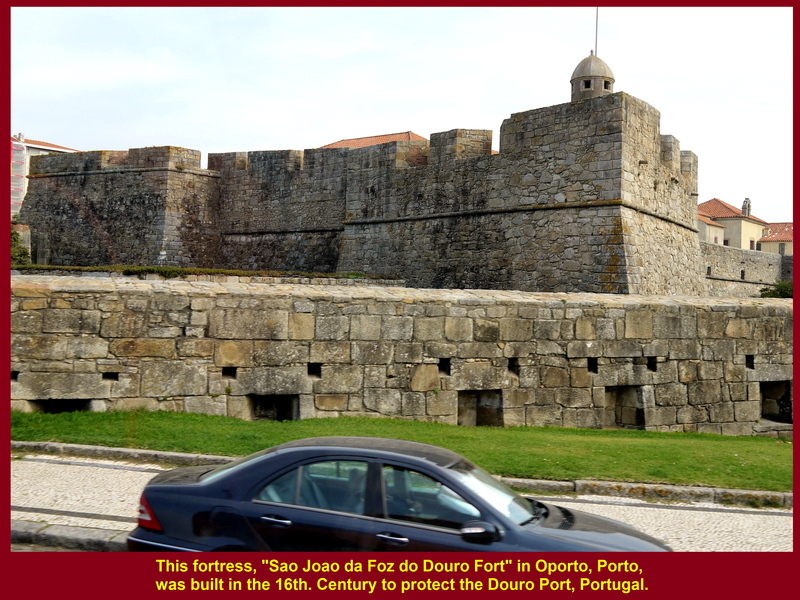 On the way to Prince Henry the Navigator Square and River Douro Valley from Liberty Square, we saw a fort near the river-mouth of River Douro. It was built in the 16th. 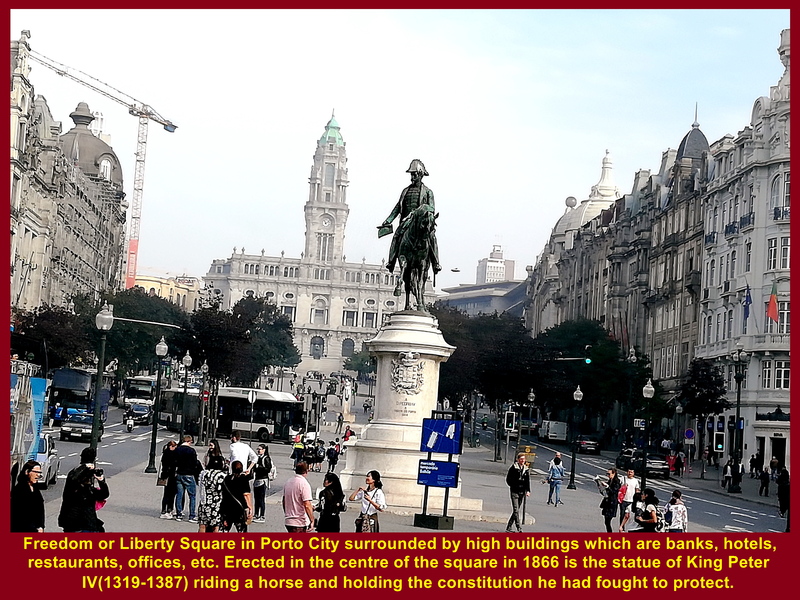 Century to protect the port of Porto from being attacked by Spanish fleets from the north. 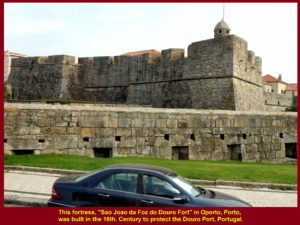 It is called Douro or Foz Castle. As we passed through the old city we noticed that its streets were narrow and lined with old buildings of a few storeys. 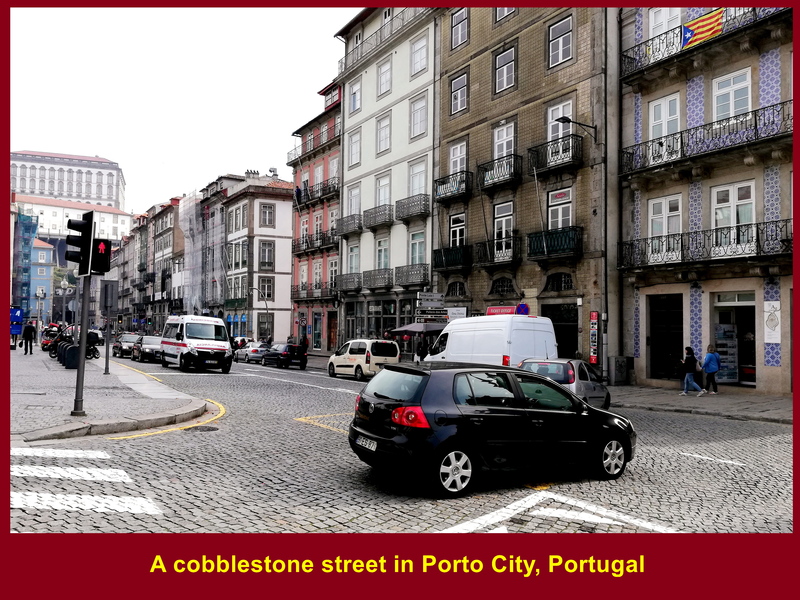 Some of the roads were cobble-stoned. There are a few old churches in the city. 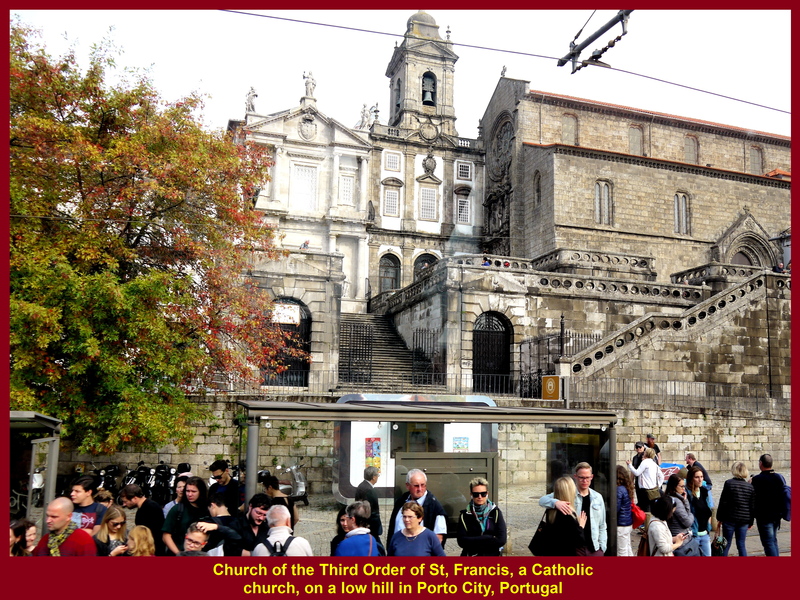 Among them is Church of the Third Order of St. Francis, a Roman Catholic church on a low hill. 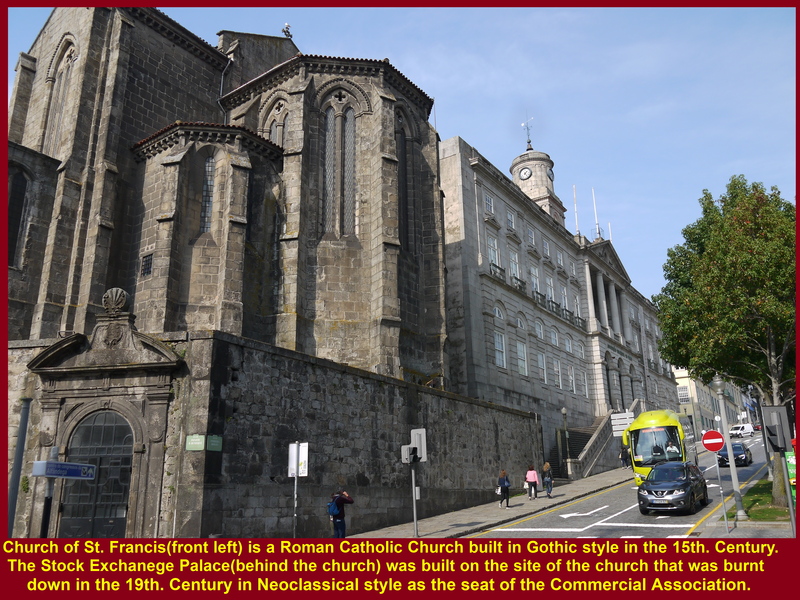 It was built in Gothic style with a large rose window on its facade between 1383 and 1425. 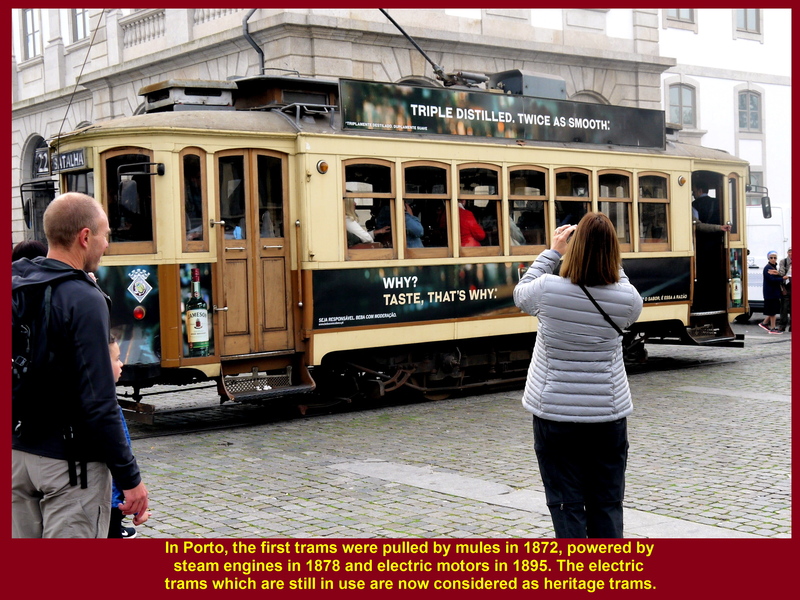 In the Old City of Porto, we also noticed that old trams or heritage trams run by electricity were still in operation. Trams in the city were first pulled by mules, then powered by steam engines and now by electric motors. Trams in Porto were first pulled by mules, then powered by steam engines and later by electric motors. After passing through the picturesque Old City of Porto, we arrived at the Prince Henry the Navigator Square. Erected in the centre of the square is a monument in memory of Prince Henry the Navigator(1394-1460). 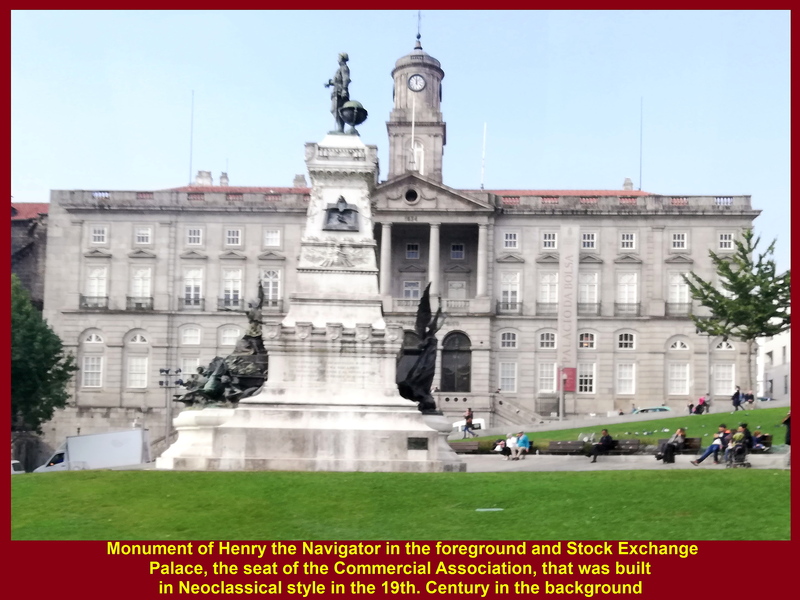 Prince Henry played an important role in the early development of Portuguese maritime exploration in the 15th. Century. The period from the 15th. until 18th. Century was known as the Age of Discovery or Expansion. He sponsored some voyages that led to the discovery of Medeira Islands and other islands off the coast of West Africa, and also some coastal areas in West Africa. 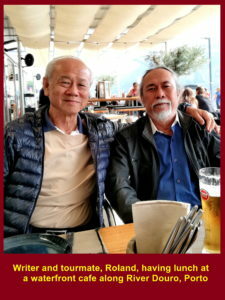 He was considered as the initiator of the interest in overseas discovery in Europe. 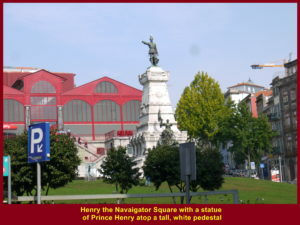 Monument in memory of Prince Henry the Navigator(1394-1460). Church of St. Nicholas which was built in the 18th. Century is a small church in Baroque-Classical styles. Stock Exchange Palace was built in Neoclassical style in the 19th. Century. It is now the seat of the Commercial Association. 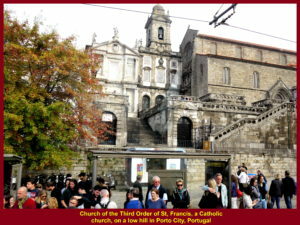 Church of St. Francis is adjacent to the Stock Exchange Palace. 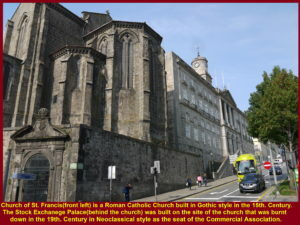 It was built in Gothic style in the 15th. Century. Then we walked down a short distance to a waterfront of River Douro known as Rebeira Walk. 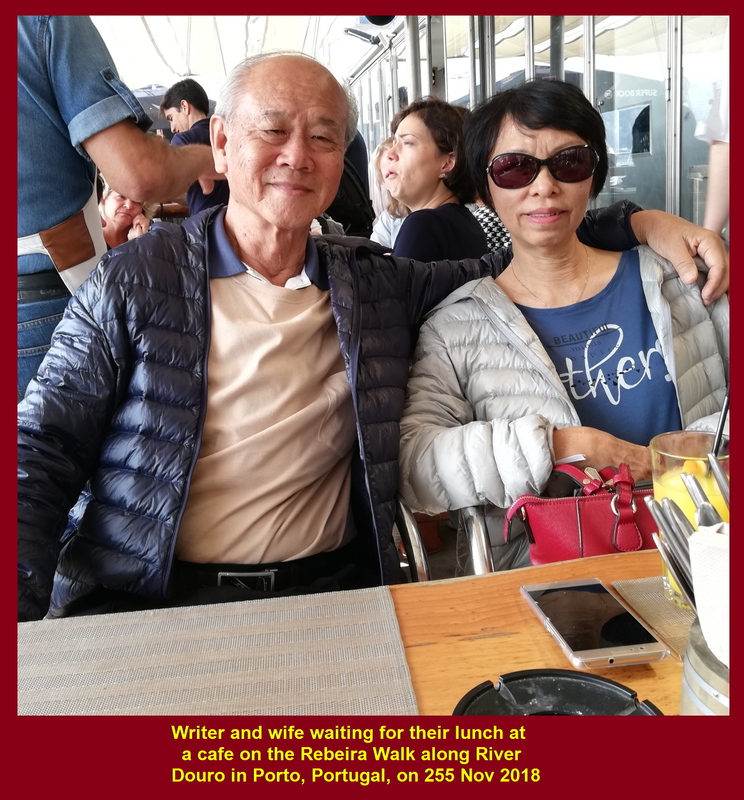 Standing on the waterfront, we saw a beautiful scenery. 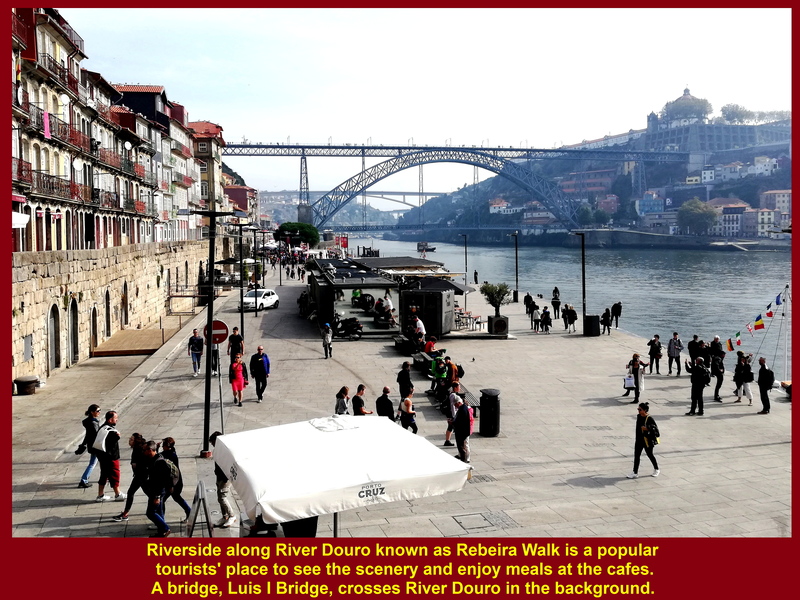 It was a picturesque view of River Douro on our right, Luis I Bridge over the river in the distance, tourists and foodstalls(cafes) on Rebeira Walk, and old. traditional and colourful shophouses on a higher ground on the left. As it was lunch-time, my wife, a tour-mate, Roland, and I had lunch together at one of the waterfront cafes. 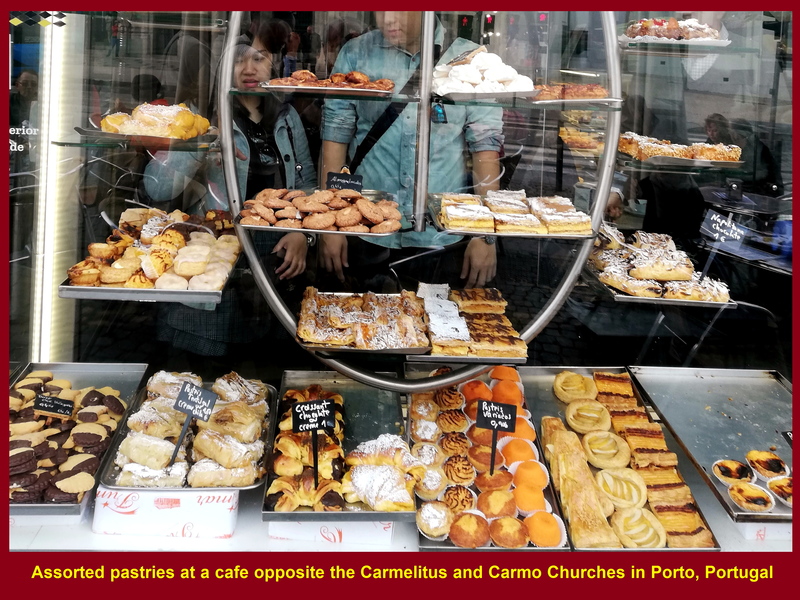 The prices of food and drinks were pricey, but we had no choice as we were hungry. 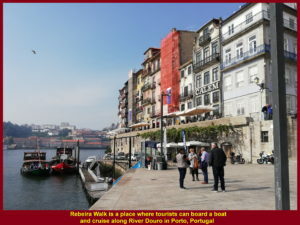 There is a place at Rebeira Walk where tourists can embark in boats for a river cruise. 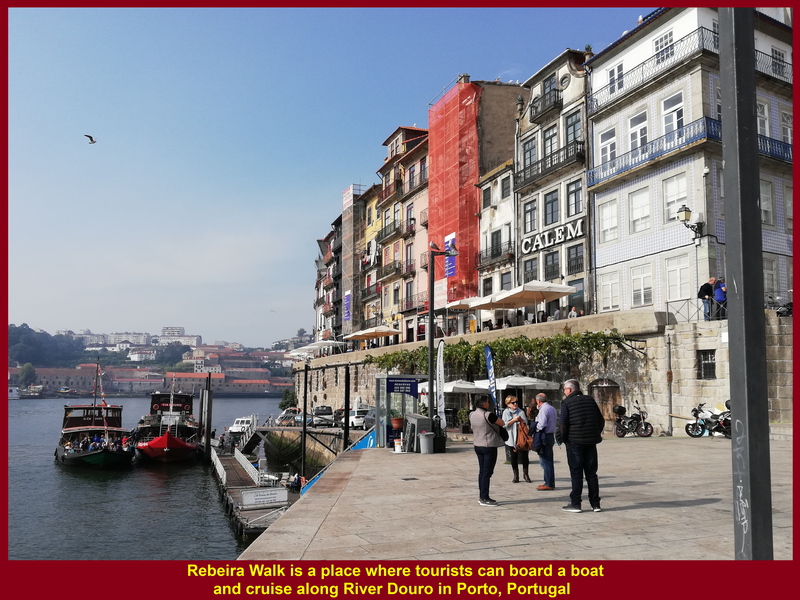 Old traditional cargo boats known as Rabelos are now used for carrying tourists for river-cruises. A river cruise may start from Rebeira Walk to the river-mouth of Douro, into the Atlantic Ocean and back. 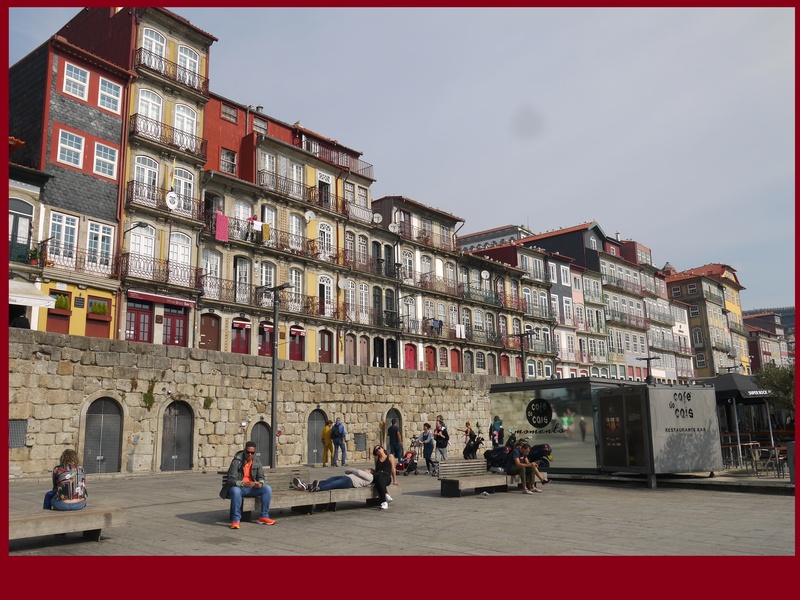 It goes under six bridges crossing River Douro and tourists on board can enjoy the quaint sights along the river. 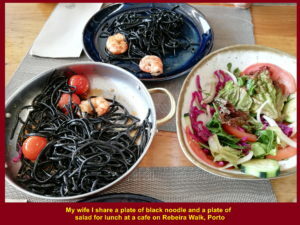 We left Rebeira Walk and went to Hotel Black Tulip in Porto to stay for a night.